I’ve been building a humble living room A/V setup this summer. When I replaced my 20″ CRT TV with a 32″ HD LCD, my Tivo developed a quiet hum. I was pulling most of my TV off of an HD Antenna, and I was too busy to really look into the problem, so apart from jiggling some cables and scratching my head I let things go. Today I got a HD Digital Cable box from Time Warner. When I hooked this up I got a “video hum”, ghost-like lines of color and brightness that slowly scroll up the screen of the TV. These distracting waves were more than I could overlook, so I started doing some research. In video, ground loop can be seen as hum bars (bands of slightly different brightness) scrolling vertically up the screen. These are frequently seen with Video projectors where the display device has its case grounded via a 3-prong plug, and the other components have a floating ground connected to the CATV coax. In this case the video cable is grounded at the projector end to the home electrical system, and at the other end to the cable TV’s ground, inducing a current through the cable which distorts the picture. As with audio ground loops, this problem can be solved by placing an isolation transformer on the cable-tv coax. 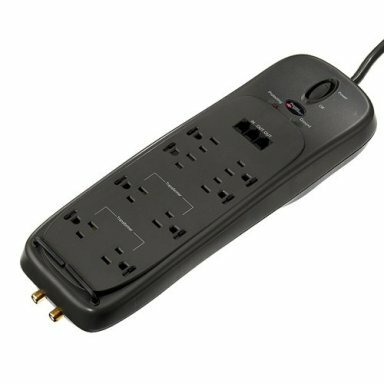 Alternatively, one can use a surge protector that includes coax protection. If the cable is routed through the same surge protector as the 3-prong device, both will be regrounded to the surge protector. I realized, the old TV had a two-prong power cord, while the new TV has a three-prong cord. The new TV was grounded separately from the incoming cable TV. I ran to Target and picked up a power strip with built in coax-protection (very much like this Power Sentry unit at Target) that provides a common ground to all of my devices. All of the visual hum is gone, and now I can be distracted by DiscoveryHD instead of video hum. Merry Late Christmas, and slightly early Happy New Year everyone! I dropped off the Earth for the last week. I got hit with something really nasty and have been completely out of commission since Christmas Day. I’m on the way back though. Today I was able to get up and set up one of my Christmas gifts from my Mom and Step-dad (Thanks so much! ), a HDTV tuner for my Macs. The Elgato eyeTV Hybrid accepts analog and digital TV signals. I picked up an over-the-air HDTV antenna and was watching hi-res TV in a very short time. The unit will also time-shift, gives you a full screen program guide, and let’s you schedule recordings ala Tivo. All of this can be done with the included Apple Frontrow remote, or with a larger included remote. The software will also automatically add recorded TV shows to iTunes, transcoded for the iPod in H.264 video if you’d like. Slick! 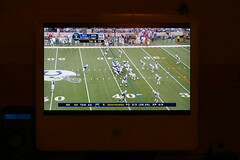 It will do everything on my iMac (Intel Core Duo) and will do Analog TV on my G4 Powerbook. My only gripe is that the unit will not time-shift Analog TV unless you are actively recording a show. My $50 Windows TV Tuner could do that, but never did anything HD. It’s a trade-off that I don’t mind. Sorry about the horrible pic… it’s very difficult to get a shot of TV and have everything in the room look normal.